Get these dates in your Travelbiz Diaries and check www.travelbiz.ie/events for more information. 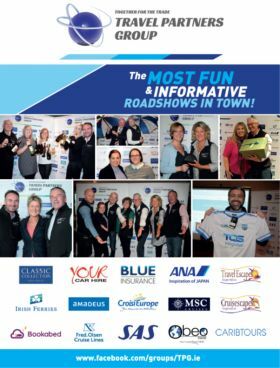 The dates for this years’ roadshows are Waterford 7th Mar, Cork 11th Apr, Galway 9th May, Dublin 22nd May, Dundalk 12thSep and Belfast 25th Sep. Venues will be announced shortly, invites will be sent to agents in the regions and posted on the TPG Facebook Page. Speaking about the launch of their 2019 schedule, Niall McDonnell (Classic Collection Holidays) on behalf of Travel Partners Group, said, “2018 was a fantastic year for TPG ,we ran 6 shows, attended by over 200 agency staff. We all really appreciate the time taken by the agents to come along and join us at the various shows. The feedback we had throughout the year was extremely positive and we know the agents love the table quiz format. We will be upping our game in 2019, changing the format slightly and obviously the chance to win our grand prize will be a huge attraction for agents to come along to the various shows”. Travel Partners Group is made up of eight key suppliers, Amadeus, ASM (representing SAS, ANA, OBEO Travel), Your Car Hire and Caribtours, Blue Insurance, Bookabed, Classic Collection Holidays , Cruisescapes, Irish Ferries and MSC Cruises.